Women have been an integral part of microfinance since the very beginning. When Muhammad Yunus founded Grameen Bank in Bangladesh, the vast majority of the bank’s borrowers were women – a circumstance that still holds true throughout the sector. Today, the growth and support of responsible financial institutions continues to deliver positive socio-economic impact to female clients through access to much-needed financial services – and also via the catalyzing effect these services have on the growth of the local economy. These sustainable institutions provide stable jobs that bring personal fulfillment and professional growth to talented, aspirational local staff, which often include a high percentage of women. Indeed, many of these institutions have transformative female leaders who are carrying out incremental but meaningful change, improving financial health and broadening financial inclusion not only on a local but on a national level. One financial institution where this phenomenon is playing out is Opportunity Bank Serbia (OBS), which provides loans, deposits and money transfer products to its clients. The bank has received around $10 million in support from MicroVest (where I work as a senior investment officer) and other impact investors in the last few years, which has helped its borrower base grow by nearly 50 percent. As its workforce expands to accommodate this growth, women continue to make up over 50 percent of its staff. OBS also has the distinction of having a female Chief Financial Officer, Zorica Sedlar. She was one of OBS’ original employees, and has spent the last eight years as CFO managing the array of needs of external stakeholders, including shareholders and regulators. Over her 30-year career, Sedlar has seen opportunity expand substantially for women in the financial sector in Eastern Europe. Her experiences have motivated her to cultivate the careers of her majority-female direct staff, as well as focus on how they can improve the lives of female clients. Globally, nearly 2 billion people are classified as unbanked and the majority of them are women. Expanding financial access to these women can protect them from being victimized by loan sharks and other bad actors in the informal economies common in their communities. That’s why it’s essential to invest in well-run financial institutions that support and broaden access to the financial tools required for personal economic stability and growth, including loans, savings, insurance and payment services. That’s also why female leadership perspectives are vital to addressing the underlying issues and developments that arise as an economy progresses toward greater financial inclusion. Yet, though the microfinance industry has many examples of women in prominent leadership positions, researchers have found that “the number of women who are employed at various hierarchical levels (board of directors, managers, staff and loan officers) within the organizations in the industry is relatively modest.” And while studies suggest that the percentage of women in top leadership positions in microfinance institutions is high in comparison to the rest of the global banking sector, it’s still lower than women’s proportion of the overall population, and far lower than the percentage of female clients served by these institutions. Investors, both individual and institutional, can help change this. By tracking their inclusion of women in leadership positions, as well as more standard criteria such as the gross loan portfolios of the institutions they finance, investors can help ensure that women play a strong role in developing banking sectors on both a community and regional level. This investor support not only advances broad, global goals, it can also make a tangible impact on individual clients. To take just one example from MicroVest’s portfolio, consider the career trajectory of Antoinette, a client at our investee Access Bank Liberia (ABL) – an institution where 60 percent of clients (and over a third of board members) are women. Before connecting with ABL in 2009, Antoinette ran a sewing business that couldn’t manage meaningful growth because she was unable to afford the upfront costs of the fabric that she turned into curtains, rugs, sheets and comforters. Then a microloan from ABL enabled her to hire an employee and purchase higher quality fabrics. Soon, she had established a good credit history and started producing steady revenue streams, which enabled her to borrow more money to grow her business. She has now made the transition from micro-entrepreneur to proud small business owner. Antoinette currently sells her products to offices across the country, and she counts the Central Bank of Liberia among her clients. ABL helped Antoinette fulfill this dream—without her initial loan, it would have been nearly impossible for her to scale her enterprise. 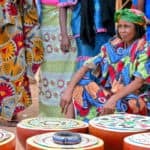 With the success of this business, she now has a larger income, so she is more resilient to economic shocks, and can plan financially for her future. Among the countless barriers to women’s empowerment, two of the biggest ones are the lack of women in leadership positions, and the lack of financial opportunities. 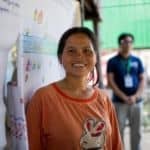 Microfinance is able to address both of these issues by supporting financial institutions and their female leaders, who in turn promote financial inclusion among female clients. As the impact investing field grows and investors increasingly engage in microfinance, it should take its lead from the sector’s women-centric focus, using its influence as investors to encourage microfinance institutions around the world to bring more women into leadership positions. Homepage photo: Women microfinance clients in Myanmar, via United Nations Development Programme on Flickr.